Have the trade unions given up on Labour? A slimmed down Trades Union Congress meeting this week on the banks of the Mersey has an air of unreality about it. 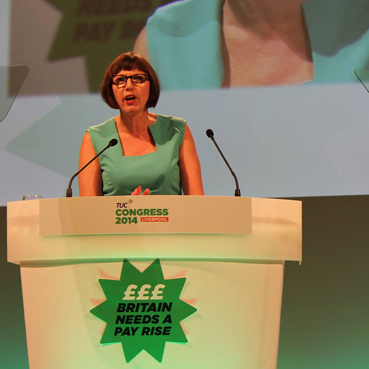 It’s not quite that no-one cares what the TUC says – trade union leaders care enough about speaking with one voice that there is even less public debate and dissent here than there is at Labour’s conference. But there is simply no mechanism to make the very good policies agreed here translate into a political reality. It is 115 years since the TUC decided to initiate what became the Labour Party, “to establish a voice for working people within parliament“. If the trade unions affiliated to Labour, who still have almost half the votes at its conference, could propose the policies agreed here in Liverpool at Labour’s conference in Manchester the week after next, they would be carried with little dissent. There is no need for trade unions to dictate to Labour; the party membership would welcome them just giving voice and their votes to what they believe. In January, in another former dockland-turned-leisure-complex conference centre, every trade union (apart from the Bakers and Musicians) voted to sever the link between the bulk of their members and the Labour party, which in time may well lead to the effective end of union political representation through the Labour party. In July, every union present at Labour’s national policy forum (apart from media and entertainment union BECTU) voted against a proposal for an incoming Labour government to end austerity by proposing an emergency budget to replace Tory cuts with investment for jobs and growth. There is a time to have heated arguments within the Labour Party about policy. There is even a time to discuss the future of the Party itself. But that time is not now. Of course some good policy concessions were made by the leadership in their negotiations with the unions behind closed doors which Billy Hayes says “should be good enough to win in 2015” but adds that “no one should seriously regard it as a sufficient basis for government until 2020”. Len McCluskey had himself gone rather further, warning that if Labour promised “a pale shade of austerity” in 2015 – as it now most certainly will – then “Labour will be defeated at the next election“. This year, just like in the run-up to every election under New Labour, trade unions leaders have fallen for that age old appeal for party unity in the hope that they live to argue another day. Forgetting that they’ve also conceded yet more changes to Labour’s structure which makes that even less likely than last time. So we’re entitled to ask…. just what is the strategy, Len and Billy? How are you going to ensure that “the collective voices of millions of working people and their families, and a hundred years of shared history, will not be washed away or sold for an electoral gimmick“, Paul? I suspect that half the candidates whom you have backed will turn out not be as resistant to the lure of climbing the greasy pole as you hope. I can’t say exactly which ones because it’s not an exact science – sometimes those with the strongest principles aren’t the ones who talk the best talk. Even if they all turn out hunky-dory, at this rate it will take ten years to really have a decisive effect on the make-up of Labour’s parliamentary party. Can I ever envisage a rules conference voting to disaffiliate from Labour? I can do – and that’s a challenge to Ed Miliband because I believe the Labour party is at a crossroads. This is a watershed. “Labour consistently has to demonstrate that it is our voice; we created it. At the beginning of the last century, ordinary working people sat down to create a party of labour so that we had a voice in the political arena. Is Labour still that voice? I’m hoping the answer to that is yes, but we are at a stage in politics at the moment where just bumbling along in the old ways is not going to happen any more. So, how do we avoid this happening? Answers welcome. Posted in: Activism, Labour, Politics, Trade Unions. The Labour party organisation of the “No” vote for the Scottish referendum was the most negative anti democratic campaign I have every seen show beyond doubt that Labour is the problem and can never be the solution. Self interest appears to be their sole motivation. Len McCluskey says he fears for the future of the Labour. The future of the Labour party is with the Blairites and for people who want political positions. Get out of the Labour party and leave it to Progess so it will be exposed for what it is. The Green party conference positioned the Greens way to the left of Labour. If only Labour had the Greens policies! One of the best MP’s on the left is the Green’s Caroline Lucas – so its one of Labour’s target seats! No real surprise there. If my auntie had testicles, she would be my uncle. Perhaps you could learn from the Lib Dems that policies formulated without the prospect of power and responsibility for government and implementation, are armchair reveries. Better to ask why the left in Britain finds it difficult to win greater support. Will you soon be saying Vote green to keep the tories out! Shades of Billy B, ha ha yawn yawn. Perhaps go to Brighton too! I recall a Trade union boss after the 92 election said at the TUC conference. This is the forth election we’ve funded labour, this is the forth election, we’ve told them what policies to have, this is the forth time we’ve lost, I think we’re backing the wrong team. There was a trade union boss in 1987 who said to the unions go to Mrs thatcher say what we want what we’re prepared to give up,as it’ll be the only way to negotiate for our workers rights as I can’t see in my life time labour winning again. Then I have a rule change, only people who are in work should vote, all those who are retired or sick disabled or unemployed should be banned from voting. I’m not working and I’m in a Union but I get sick and tired these day the Unions are as bad as the labour party none of them are working class they are all hard working. The fact is the majority of the people in work do not join Unions and I can now under stand why. Time for me to pack up my Union because it obviously does not represents anyone else except the hard working, Blair and Progress and the GMB. God help us, because now I understand why people say to me why waste money in a union they are in it for themselves.